Number of Cards: 640. Cards 1-440 were sold in the silver-colored packs. The last 200 cards were found in gold-colored “High Series” packs, which had a mix of all cards 1-640. Insert Cards: 2 Special Prints (SPs), 7 All-Rookie Team, 6 All-World Team, 6 Ameri/Can Rookie Team Holograms, 6 Euro-Rookie Team Holograms, 20 Euro Rookies, 20 Euro Stars, 20 Gordie Howe Selects, 10 Gretzky Heroes, 10 Howe Heroes, 20 World Junior Grads, 20 Calder Candidates. Original Cost: Around 99 cents for a 15-card pack. Jumbo packs containing 23 cards had a suggested retail price of $2.69. Euro Stars were found only in jumbo packs. Rookie Cards of Scrub Players Found Only In This Set: Mikhail Kravets, Darcy Werenka, plus a good number of players found in the IIHF World Championship and World Junior Championship tournament subsets who never played for an NHL team. 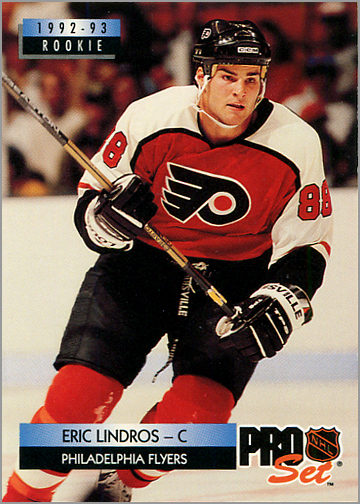 How Did Upper Deck Include Eric Lindros? 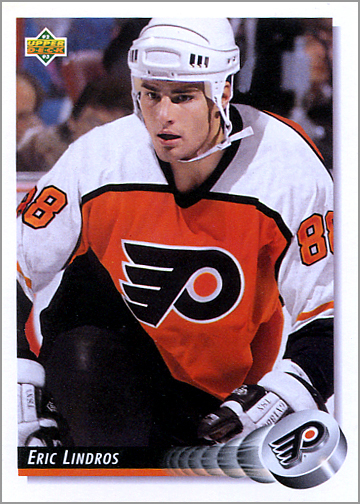 Upper Deck included Lindros as card #88 in the set. 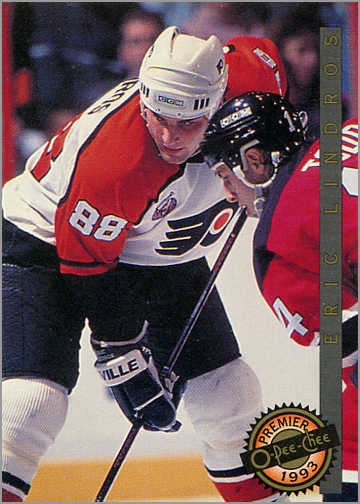 Since they didn’t have a game-action shot of him in time for production, they took a photo of Rod Brind’Amour from the prior year and digitally slapped Lindros’ noggin on his shoulders, as well as altering the sleeve number to 88. 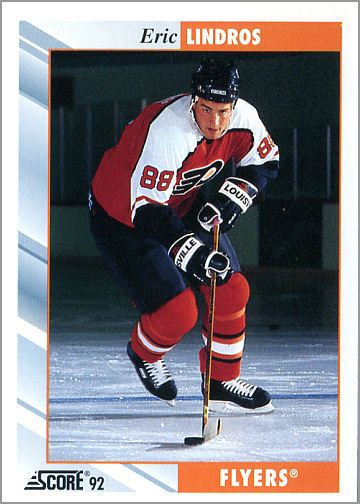 Fun Facts: That “head swap” card of Lindros (#88) was somewhat controversial, so Upper Deck did not put it into High Series packs. 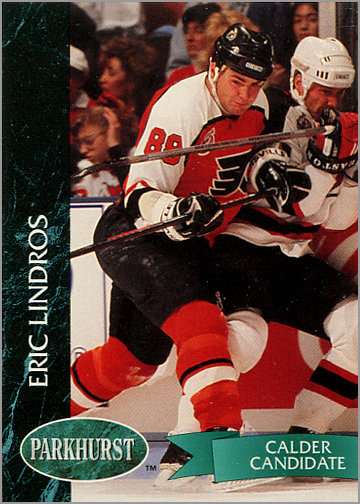 A different card of Lindros (#470) was instead found in those packs, giving The Big E two cards in that set. 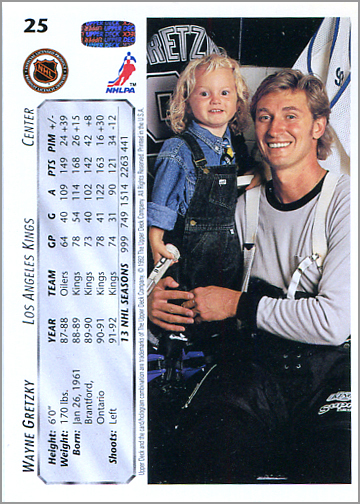 One of the Wayne Gretzky cards shows The Great One with his daughter Paulina Gretzky, a good 20 years before she’d become a Maxim cover model. 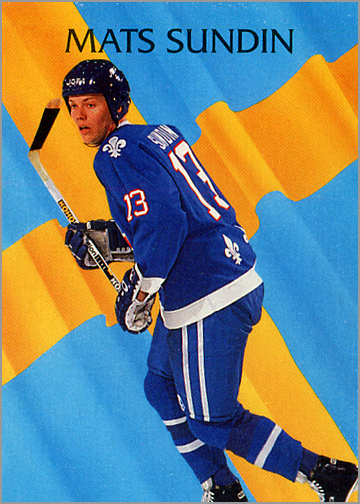 Why Upper Deck is #1: Upper Deck was the number one this season for the same reason it was in 1990-91 and 1991-92: excellent photography, high-quality production values and lots of variety – from its World Junior Championships subset, which included many upcoming prospects, to the illustrated checklists, to “Bloodlines” cards featuring brothers who play in the NHL, to Award Winner cards. 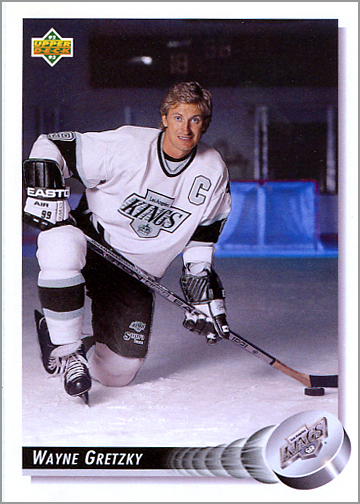 Lasting Legacy: Upper Deck is currently the only company still making hockey cards today. Number of Cards: 450 cards, distributed in two 225-card series. 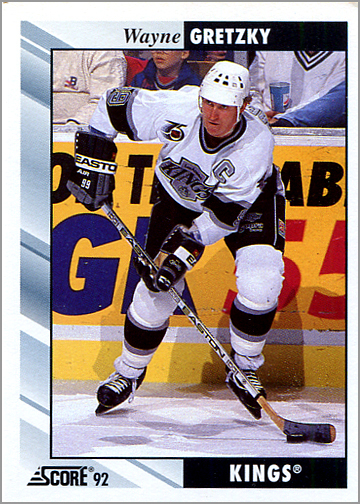 Insert Cards: 12 Jeremy Roenick Performance Highlights, 12 All-Stars, 10 Award Winners, 8 Ultra Rookies, 25 Ultra Imports. Cards autographed by Roenick could also be found once in every 8,000 packs. Original Cost: Around $2 for a 14-card pack. Notable Rookie Cards: Bill Guerin, Roman Hamrlik, Sergei Zubov. 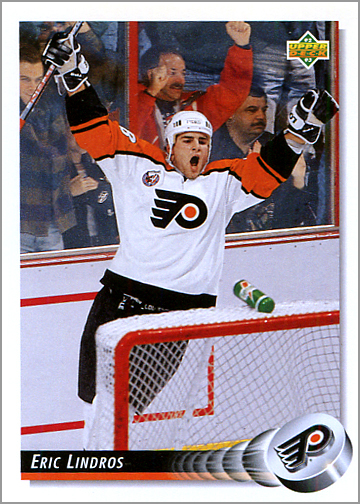 How Did Fleer Ultra Include Eric Lindros? 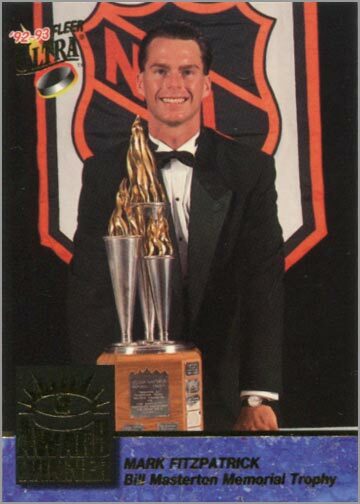 Fleer used photos of Lindros from the pre-season, as evidenced by the lack of Stanley Cup 100th Anniversary patch, which all NHL teams wore on their uniforms during the 1992-93 regular season. 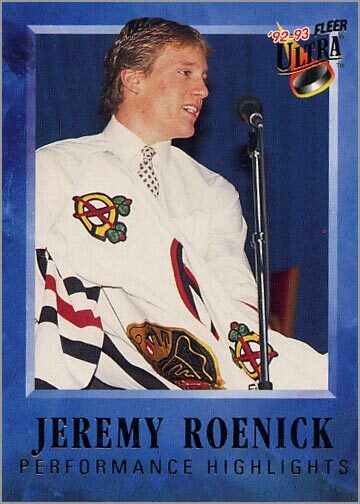 Fun Facts: Jeremy Roenick was the spokesman for Fleer during the early 1990s. The last two cards of the 12-card Roenick Performance Highlights insert set were available by mail for $1 plus 10 Fleer Ultra wrappers. 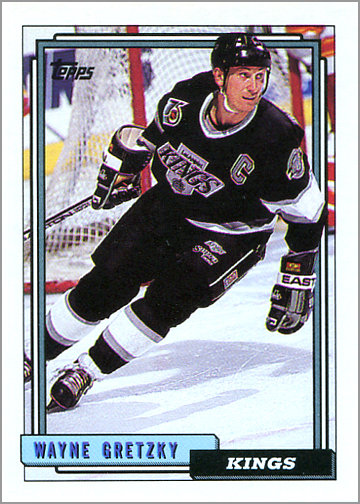 Why Fleer Ultra is #2: Fleer’s debut into hockey started off with a bang. The cards exude an overall feeling of quality that the other sets at the time didn’t. Both sides are UV coated, giving them a rich, glossy feel. The slight use of gold foil enhances the design, without being annoying or overpowering. The set also effectively uses three photos – one on the front and two on the back – really giving you a lot for your money. 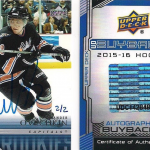 Lasting Legacy: Today, Upper Deck owns the Fleer Ultra name, and sometimes makes Fleer Ultra hockey cards. 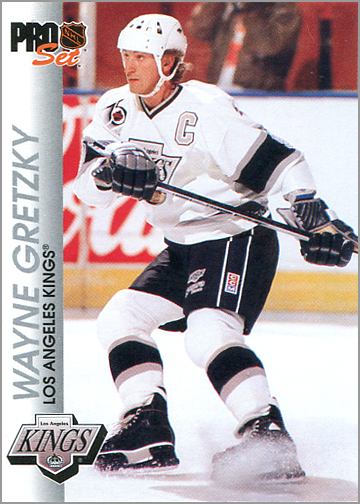 The 1992-93 Fleer Ultra Hockey design was used for insert cards from the 2012-13 Fleer Legacy Hockey set. Number of Cards: 510 cards. Series One had 240 cards and Series Two also had 240 cards. A 30-card Final Update set was available only as a mail-away boxed set. Insert Cards: 20 Cherry Picks and 36 Parkie Reprints, plus Emerald Ice Parallels of all 510 cards. Original Cost: Around $1 for a 12-card pack, which included one Emerald Ice Parallel. Jumbo packs had 23 cards plus two Emerald Ice Parallels. The Final Update set could be ordered from Pro Set for $15.95 plus 10 Parkhurst Series Two Wrappers, while an Emerald Ice version of the Final Update Set plus a three-ring Parkhurst album could be ordered for $54.95 and 10 Parkhurst Series Two Wrappers. Language Variations: Bilingual (English and French) only. Notable Rookie Cards: Bill Guerin, Roman Hamrlik, Michael Nylander, Ray Whitney. Rookie Cards of Scrub Players Found Only In This Set: John Blue, Andre Faust, Mike O’Neill, Jaroslav Otevrel. How Did Parkhurst Include Eric Lindros? 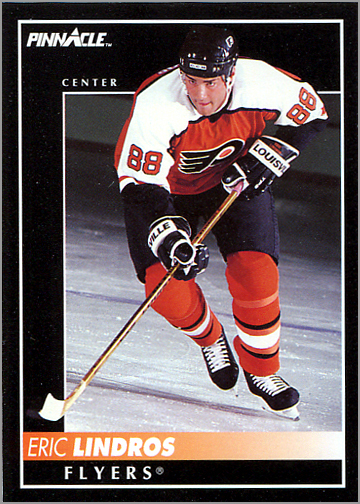 Lindros’ card uses a photo from an early regular season game– most likely the October 17, 1992 game at New Jersey. The Cherry Picks insert card uses a photo that was probably taken at the same game. 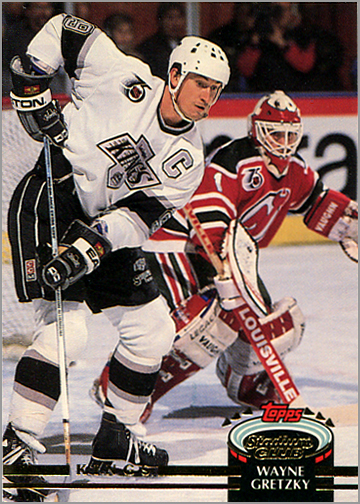 Fun Facts: Even though Pro Set did produce Pro Set Series One for the 1992-93 season, Parkhurst was truly the company’s swan song, as they put all their efforts into it with two series, a Final Update Set and a custom binder. 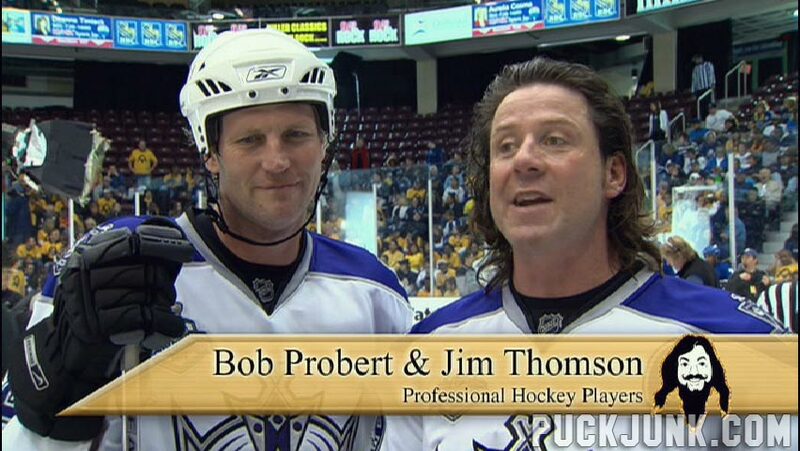 Had Pro Set lasted another year, they would have made Parkhurst their main brand for all sports moving forward. Series One wrappers had a mail-away offer for a custom 1991-92 Parkhurst binder for $3.75 plus 12 1992-93 Parkhurst Series One wrappers. Parkhurst also issued a five-card Parkhurst Preview set, which is notable because it uses different photos than the regularly-issued cards of those five players. 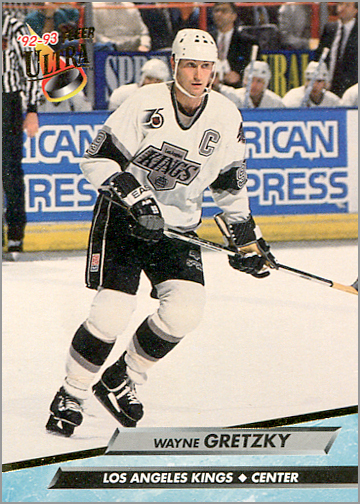 Why Parkhurst is #3: Pro Set tried really hard to make Parkhurst a great hockey set – probably as a last-ditch effort to be a profitable company once more. The cards have a clean design and solid photography. Some of the subsets are pretty cool, too, such as International Rising Stars, which riff on the 1963-64 Parkhurst design with a flag as a backdrop, and Broad Street Bullies, which feature illustrations of the Flyers’ best players from their dynasty years. Lasting Legacy: The Parkhurst name would continue in the future, with companies like Upper Deck and In The Game producing various Parkhurst sets over the next 20-plus years. Number of Cards: 550 cards distributed in one series. Insert Cards: 13 Canadian Olympic Heroes, 30 Sharpshooters and 2 Maurice Richard inserts. Autographed versions of the two Richard inserts were also possible to pull and were limited to 1,250 copies each. Original Cost: I’m guessing maybe $1 for a 16-card pack. Language Variations: Bilingual (English and French) only. Score did not produce an English-only set for Canada this season. Notable Rookie Cards: Bill Guerin, Ray Whitney. Rookie Cards of Scrub Players Found Only In This Set: None. How Did Score Canadian Include Eric Lindros? 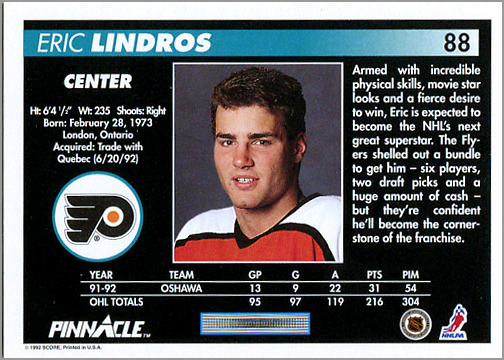 Score signed Lindros to an endorsement deal in 1990. For all of its 1992-93 sets, Score used photos of Lindros, in full equipment and Flyers uniform, from an on-ice photo shoot. 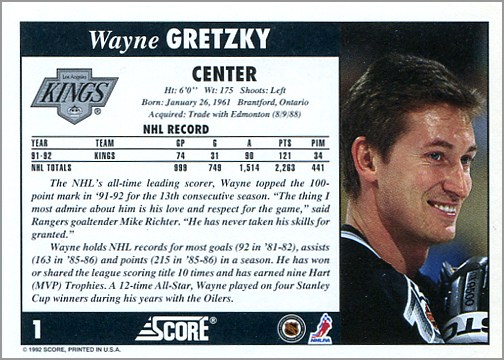 Fun Facts: Although the 1992-93 Score Canadian set has a nearly-identical checklist to the 1992-93 Score American set, the card design differs on the front and the back. Also, of the 550 cards, 500 of them use different photos on the front and back, making the Canadian and American sets feel less like parallels of each other (like they did in 1990-91) and more like truly unique sets. That is why these two sets are ranked separately here. Only cards #548 and #549 differ between the Canadian and American sets. Here, those cards are of Maurice Richard, while in the American set they are of Jay Wells and Mick Vukota, respectively. Lasting Legacy: This was the only time that Score would issue two wildly different designs for the Canadian and American markets. Next year, both the Canadian and American sets would share the same design. Insert Cards: 15 USA Greats, 30 Sharpshooters. 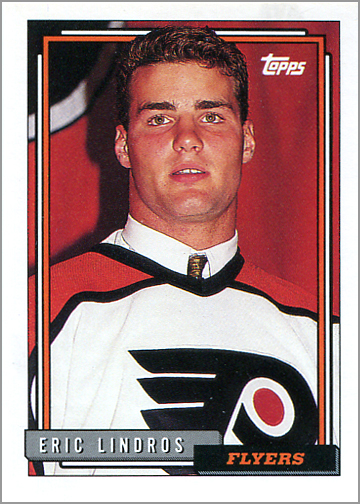 A special card of Eric Lindros from the July 15, 1992 press conference with the Flyers could be found roughly one in every 500 packs. Original Cost: 50 cents for a 16-card pack. How Did Score American Include Eric Lindros? Score signed Lindros to an endorsement deal in 1990. For all of its 1992-93 sets, Score used photos of Lindros, in full equipment and Flyers uniform, from an on-ice photo shoot. Fun Facts: As mentioned above, the American and Canadian Score sets use different front and back designs, as well as different photos for 500 of the cards. That really sets these two, um, sets apart from one another. Cards #548 and #549 are of Jay Wells and Mick Vukota, respectively, whereas in the Canadian set the cards are of Maurice Richard. Why Score American is #5: Since it is virtually the same set, checklist-wise, as its Canadian counterpart, the 1992-93 Score American set ranks high for all the same reasons. The Canadian set is ranked slightly higher because of a better front design, as well as including two cards of Rocket Richard. 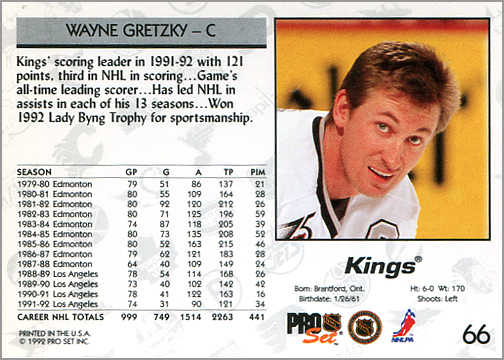 Lasting Legacy: Score was a consistent player in the hockey card market from 1990-91 to 1997-98. The Score name was revived from 2010-11 to 2013-14 under Panini America. Number of Cards: 442 cards. 397 were standard cards, while 45 had gold foil borders. 18 of these gold-bordered cards were short prints. Insert Cards: None, though every pack guaranteed one gold-bordered card. Original Cost: Probably $2 or $3 for a 15-card pack – but that shot up to $15 per pack as collectors and dealers figured out how relatively underproduced Bowman was that year. Each pack had 14 regular cards and one gold-foil-bordered card. 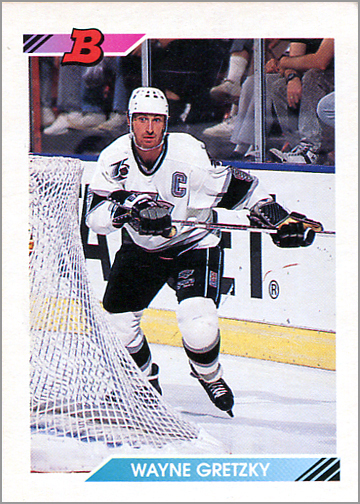 Notable Rookie Cards: Uhhh…Guy Hebert? How Did Bowman Include Eric Lindros? 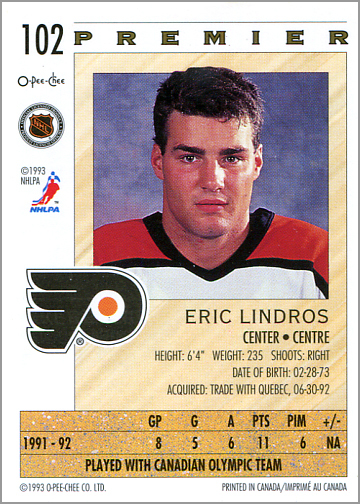 The set was intended to be 441 cards, but late during production Topps printed a Lindros card using a photo from a press conference. It is card #442 and not listed on the checklist. Fun Facts: Bowman was so unpopular during the 1991-92 season that dealers underordered it for 1992-93. Therefore, it was not produced in large quantities. Allegedly, only 2,000 16-box cases were made. That’s not a whole lot when compared to the other card sets on this list. 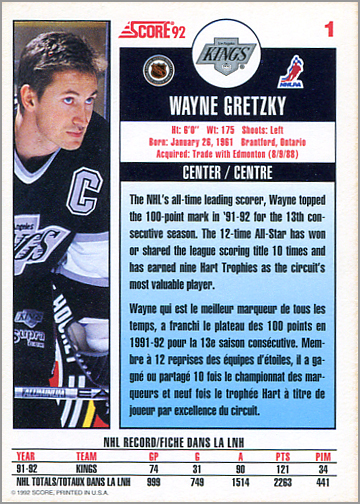 The 44 of the 45 gold-bordered cards are of players from the 1991-92 All-Star Game, while one gold-bordered card is of Mario Lemieux with the Conn Smythe Trophy. 18 of the gold-bordered All-Star cards were short-printed, making Bowman a very challenging set to put together. Why Bowman is #6: With photos on both side and full-color backs, Bowman is actually a nice-looking set. 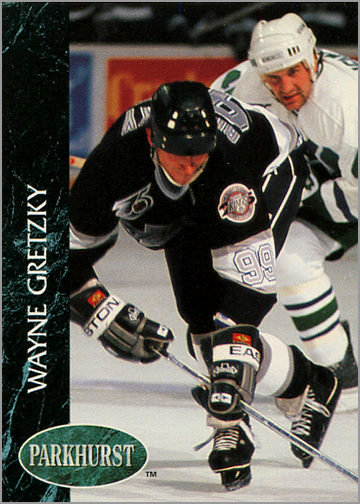 No, it doesn’t have any players from the 1992-93 expansion teams, but it does a good job of showcasing players from the previous year, as a good card set should do. If Bowman looked like this in 1990-91 or even 1991-92, it would have been way more popular. Plus, it gets points for being a relatively-rare set from the era of junk wax. 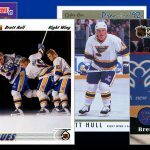 Lasting Legacy: The appeal of the 1992-93 Bowman Hockey set is that it is pricey when compared to other 1992-93 hockey sets. A complete set with all short prints seems to sell for around $60, which isn’t super-expensive, but still way more expensive than most of the other sets from 1992-93, which sell in the $5 to $15 range. Number of Cards: 420 cards. Insert Cards: 6 Team Pinnacle and 30 Team 2000 cards. Original Cost: Around $1.50 for a 16-card pack. Jumbo-sized “Super Packs” had 25 cards plus two Team 2000 insert cards and had a suggested retail price of $2.99. Notable Rookie Cards: Roman Hamrlik, Michael Nylander, Ray Whitney. 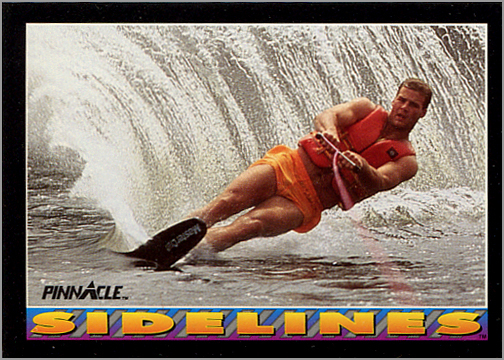 How Did Pinnacle American Include Eric Lindros? 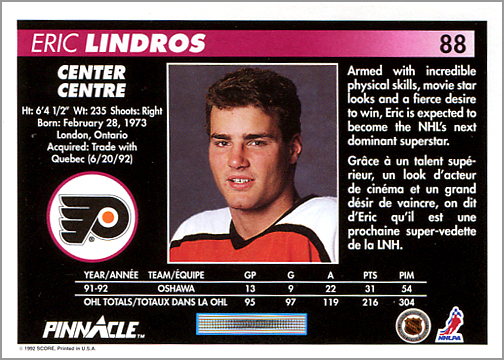 Score signed Lindros to an endorsement deal in 1990. For all of its 1992-93 sets, including Pinnacle, Score used photos of Lindros, in full equipment and Flyers uniform, from an on-ice photo shoot. Fun Facts: This set has the exact same checklist as the 1992-93 Pinnacle Canadian set but uses different photos on the front of all 340 player cards (cards 1-220 and 271-390). Both sets use the same photos on the back and the same photos for the subset cards. An uncut panel of six promo cards were given to dealers. Why Pinnacle American is #7: Score improved on the design of Pinnacle from the previous year. 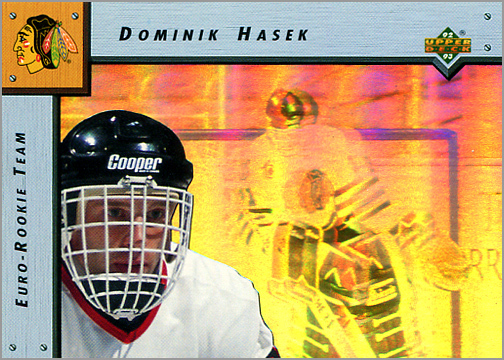 Card fronts show a player “breaking out” of the background and are glossy. Card backs use a nice, studio portrait of each player without his helmet. 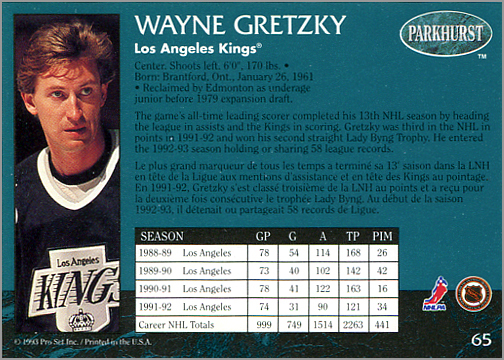 The reason why the American version ranks higher than the bilingual Canadian Pinnacle set is that, since the cards do not have French text, the biographies on the back are twice as long. All other things being equal, the extra paragraph sets the two sets apart. Lasting Legacy: Pinnacle morphed into that set that would use goofy photos. In 2010-11, it was revived by Panini America…as that set that would use goofy photos. 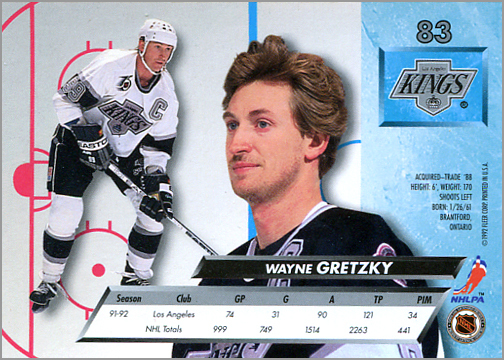 Bonus: Here is a review of the 1992-93 Pinnacle Hockey Team Pinnacle insert set. Original Cost: Around $2 for a 16-card pack. 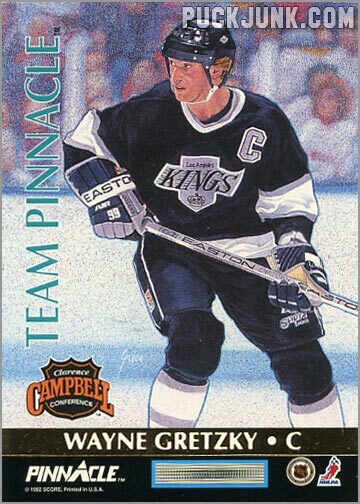 How Did Pinnacle Canadian Include Eric Lindros? Score signed Lindros to an endorsement deal in 1990. 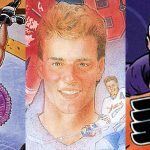 For all of its 1992-93 sets, including Pinnacle, Score used photos of Lindros, in full equipment and Flyers uniform, from an on-ice photo shoot. 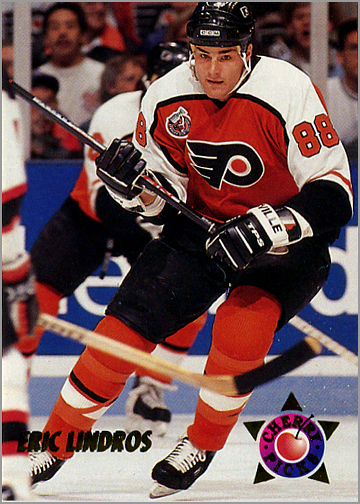 On this card, it appears that Lindros missed the puck. Fun Facts: It’s basically the same set as the American Pinnacle set, but with different photos on the fronts of 340 of the cards. An uncut panel of four promo cards were given to dealers. Why Pinnacle Canadian is #8: It’s as good as the Pinnacle American set, but has less text on the back, since it has to include the same text in French. If you don’t read French, or don’t appreciate the different photos on the cards, then you can skip this one. 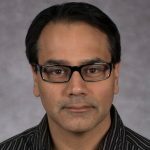 Lasting Legacy: Score would release separate American and Canadian Pinnacle sets the next year, then would make English-only Pinnacle sets starting in 1994-95. Number of Cards: 396 cards. Insert Cards: A “25th Anniversary” set features 25 reprints of popular O-Pee-Chee rookie cards, plus a checklist, for a total of 26 cards. There are also four oversized (5” by 7”) box-bottom cards featuring Award Winners. Original Cost: $1.00 for a pack that had eight standard cards and one insert card. Cello packs had 16 regular cards and two insert cards, and probably cost around $2.00. 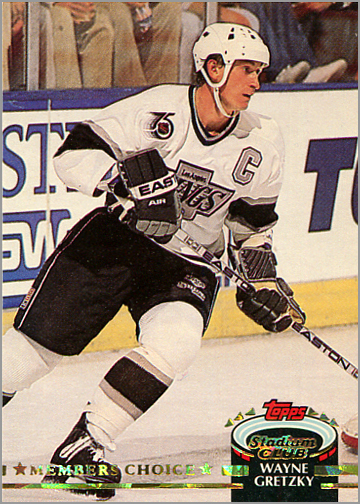 Notable Rookie Cards: Bill Guerin. How Did O-Pee-Chee Include Eric Lindros? O-Pee-Chee didn’t try. Like, they didn’t even bother to include the biggest, most hyped prospect since Mario Lemieux in its set. At the very least, they could have snuck him into packs like Topps did with its Topps, Bowman and Stadium Club sets. Fun Facts: Factory sets, serial-numbered to 12,750, were also available. 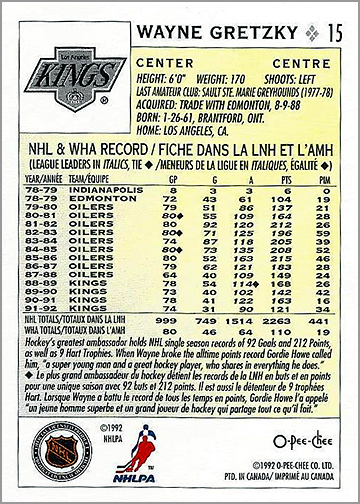 Why O-Pee-Chee is #9: O-Pee-Chee has a simple front design, and is one of only three sets to include each player’s complete career statistics. It also plays heavily on nostalgia; not only are there 25 “Rookie Reprint” insert cards, but 25 cards in the regular set also take popular rookie cards from the company’s history, re-imagined with different photos. 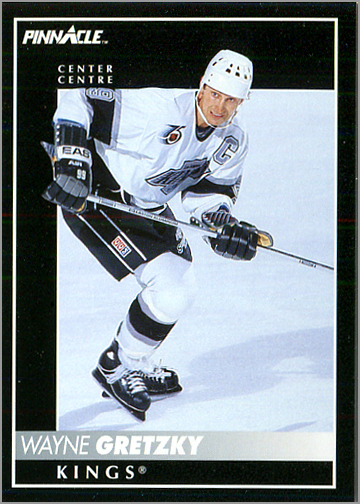 However, the relatively-small checklist and lack of up-to-date player photos really hampers O-Pee-Chee. Lasting Legacy: Today, Upper Deck makes O-Pee-Chee cards, but isn’t allowed to use any of the old card designs, which are still owned by Topps. Number of Cards: 529 cards. Insert Cards: Topps Gold parallels, found one per pack. Original Cost: 55 cents for a 15-card pack (14 cards plus one Gold parallel). Jumbo packs had an SRP of $1.69 and contained 42 cards (39 cards plus three Gold parallels). Boxed sets had the complete 529-card set and included 20 random Gold cards. 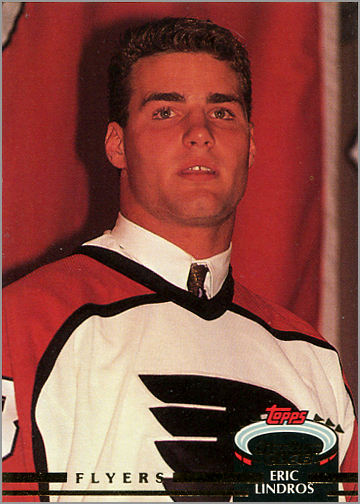 How Did Topps Include Eric Lindros? 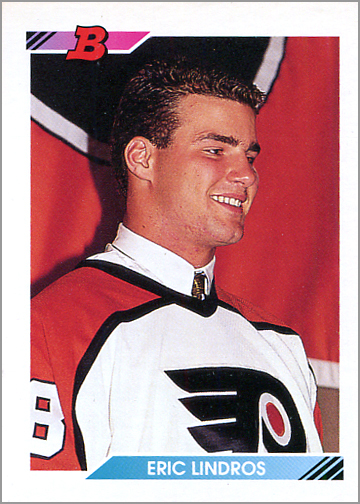 Late during production, Topps printed a card of Lindros and inserted it into packs. The card uses a press conference photo and is number #529. It is not listed on the checklist. A Gold parallel version of this card was also made. 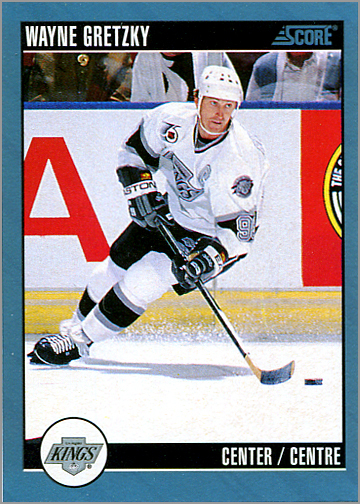 Fun Facts: Jim Thomson, who would later play the long-haired team captain of the L.A. Kings in the 2008 movie The Love Guru, has his rookie card – actually, his only NHL card – in this set. Instead of printing Gold parallels of the checklists (cards #525 to #528), Topps instead made Gold cards of Al Conroy, Jeff Norton, Rob Robinson and Adam Foote. 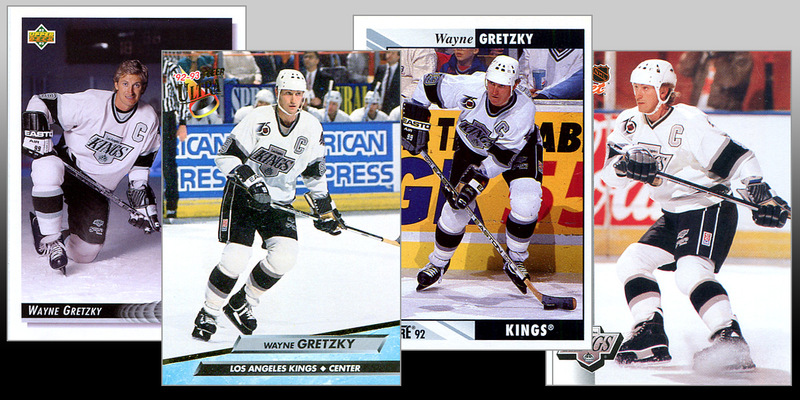 The 1992-93 Topps Hockey set uses the same design as 1992 Topps Baseball, 1992 Topps Football and 1992-93 Topps Basketball. 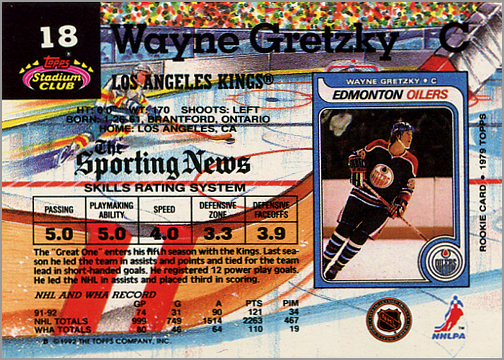 Why Topps is #10: Even when Topps made improvements to its hockey cards, the company was still way behind the times. Yes, the set was large at 529 cards and was printed on white cardstock, but the overall design is lackluster – even more so since Topps used the design on all of its sports card sets that year. Topps was one of the only three sets to include each player’s entire career statistics on the back, but even full stats couldn’t save Topps. 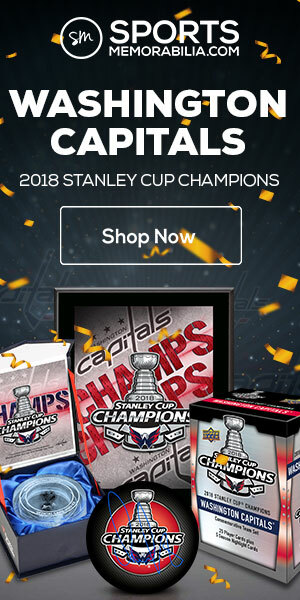 Lasting Legacy: Today, Topps does not have the right to make NHL trading cards, though it does make digital hockey cards with its NHL Skate mobile app. Number of Cards: 501 cards. Series One packs had cards 1-250, while Series Two packs had cards 251-501. 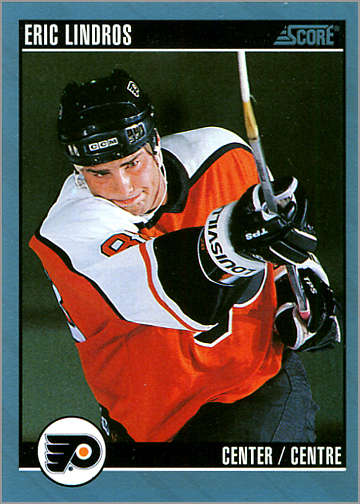 How Did Stadium Club Include Eric Lindros? 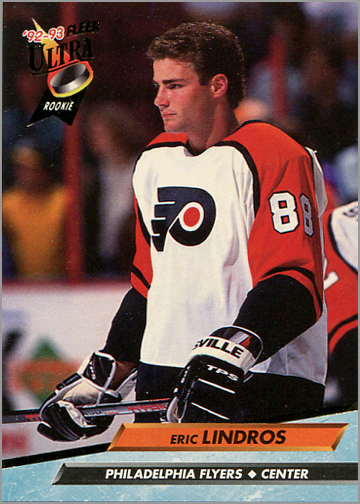 Late during production, Topps printed a card of Lindros and inserted it into packs. The card uses a press conference photo and is number #501. It is not listed on the checklist. Fun Facts: The backs of the cards picture each player’s “Rookie Card” – though, more accurately, it is of that player’s “First Topps Card”…unless you really think Mark Messier’s rookie card was in 1986-87 Topps. Also, the Members Choice subset uses a shimmery, diamond-pattern foil instead of gold foil, for what it’s worth. Why Stadium Club is #11: Stadium Club came out in two series, but Series Two doesn’t feature any hot rookies from that season like Teemu Selanne, nor does it picture traded players or players drafted by expansion teams in their new uniforms. 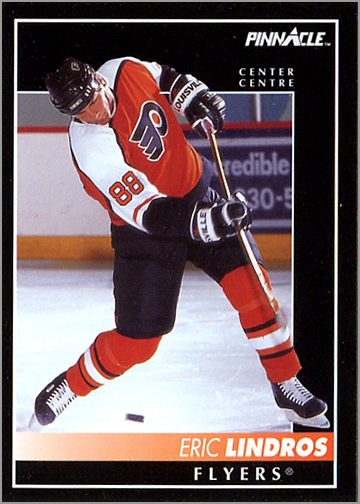 Heck, by the time Series Two came out, Lindros had played in numerous games, so a game-action photo could have been used instead. My theory is that Topps originally planned Stadium Club to be one huge set, selected the photos over the summer, but then ultimately decided to break it into two separate series. Lasting Legacy: Stadium Club would continue as a hockey set throughout the 1990s and early 2000s. Number of Cards: 270 cards. Original Cost: 50 cents for a 15-card pack. Notable Rookie Cards: Bill Guerin, Ray Whitney. 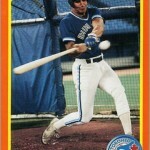 Minor-league legend Jock Callander also has his rookie card in this set. 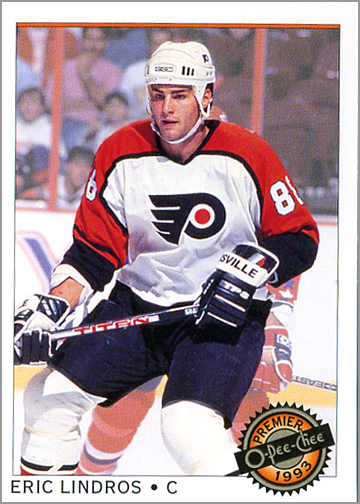 How Did Pro Set Include Eric Lindros? Pro Set used a photo of Lindros from a preseason game, as evidenced by the lack of the Stanley Cup 100th Anniversary patch on his Flyers’ jersey. Fun Facts: A Series Two was planned, but never released. 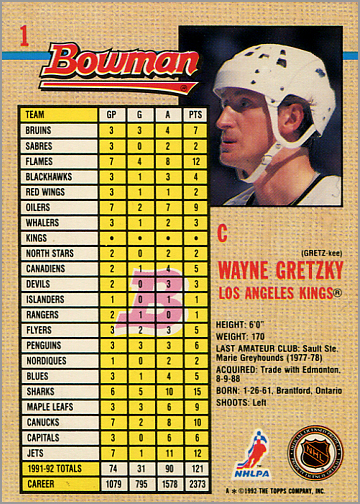 This was the only time Pro Set included complete, year-by-year statistics on the back. These cards use the new Pro Set logo. The original design was very different than what was ultimately delivered. Why Pro Set is #12: The 1992-93 Pro Set Hockey set isn’t a terrible set. The design is crisp and clean, and the backs are easy-to-read and include complete statistics. But what really hurt Pro Set this year is that Series Two never came out, making this set forever unfinished. Had Series Two been released, Pro Set would have been within the top three sets for 1992-93. 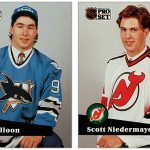 Lasting Legacy: Today, Pro Set cards are a dime a dozen – and even that might be generous – but the 1992-93 Pro Set Hockey cards are a bit uncommon, as far as 1990s hockey cards go. Not rare or expensive; just not usually found nearly as often as 1990-91 or 1991-92 Pro Set hockey cards. Insert Cards: 22 Star Performers, 4 Top Rookies. Original Cost: $2 for a pack containing 7 cards and 1 insert card. Notable Rookie Cards: Roman Hamrlik, Michael Nylander. 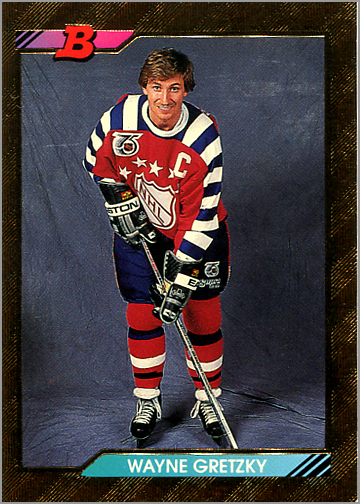 Rookie Cards of Scrub Players Found Only In This Set: Darren Banks, Bob Babcock, Dan Laperriere. How Did O-Pee-Chee Premier Include Eric Lindros? 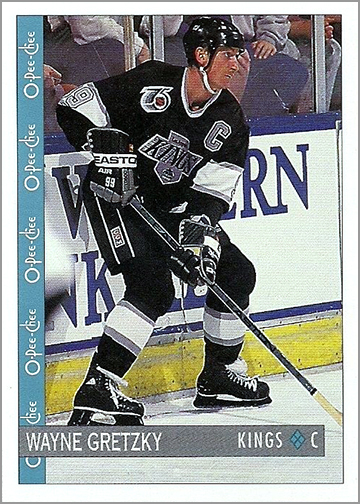 O-Pee-Chee used a picture of Lindros from a preseason game for his card in the regular set, and a picture of Lindros from an early season game for his Top Rookies insert; probably his home debut vs. New Jersey on October 9, 1992. 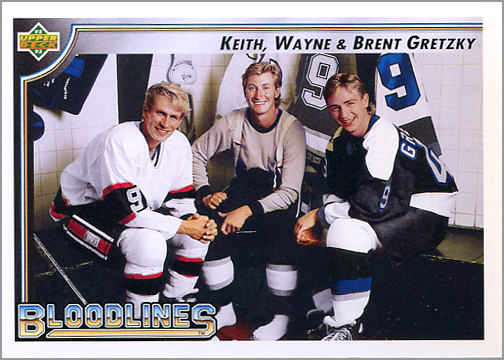 Fun Facts: Wayne Gretzky isn’t in this set. He isn’t even in the Star Performers insert set. 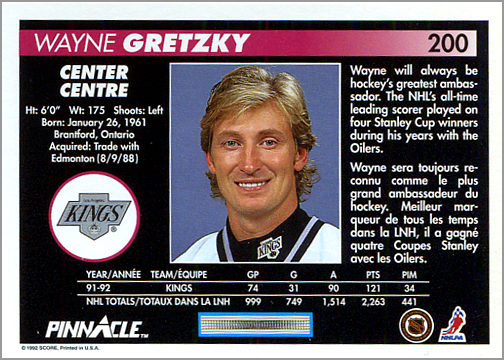 This makes O-Pee-Chee Premier the only major trading card set from this year to not have a card of Wayne Gretzky. 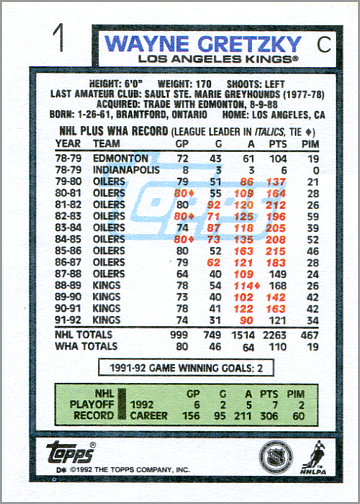 Why O-Pee-Chee Premier is #13: The 132-card set lacks all of the biggest stars of the day. No Gretzky, Lemieux, Hull, Roy, Messier or Fedorov. Instead, O-Pee-Chee Premier is chock-full of guys who played two games last season, or recently changed teams. So, if you yearned for cards of Shawn Crownin or Darcy Loewen in their new uniforms, this is your set. 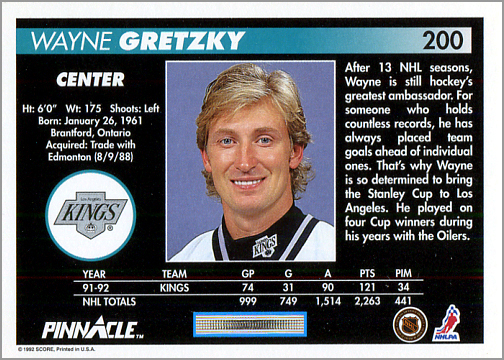 Granted, most of the biggest stars (but not Gretzky) are found in the 22-card Star Performers set. I guess Premier works all right as an “addendum” or “update” to the 396-card O-Pee-Chee set, but it doesn’t stand well on its own. 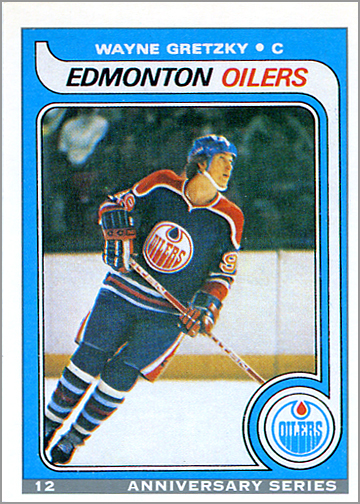 Lasting Legacy: This was the last year that O-Pee-Chee Premier was a standalone set. Next season, the “Premier” name would be used by both Topps and O-Pee-Chee, who basically sold the same 528-card set, but called it either “Topps Premier” or “O-Pee-Chee Premier.” During the past decade, Upper Deck issued “O-Pee-Chee Premier” as a high-end set of hockey cards. Like the 1990-91 and 1991-92 seasons, most sets from 1992-93 are massive in size, yet cheap to own. If you started collecting after that season, and don’t own anything from ’92-93, go ahead and get a few sets; you’ll get change back from your $20, and get a lot of enjoyment out of them. 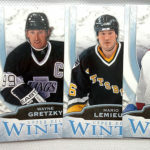 What do you think of this ranking of the 1992-93 hockey sets? 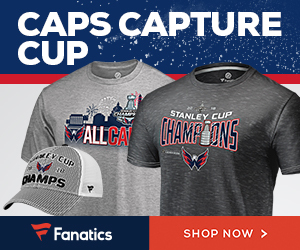 What was your favorite and/or least favorite hockey set from the 1992-93 season? (Totally cool if was Bowman, FYI.) Leave a comment and let me know. 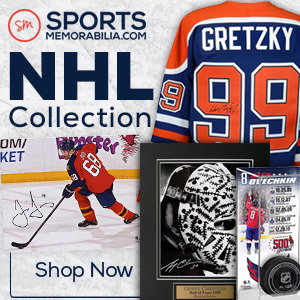 Shop NHL Collectibles at SportsMemorabilia.com. Use Coupon Code 10OFF2018 at checkout to save $10 off purchases over $100. I have only really been collecting the NHL since January 2017, but I wish I had been following it then. Would have been nice to have memories of these in addition to the cards I had been collecting then. I don’t have any of the Bowman cards from this season yet. I didn’t know there was a reason for that, I just figured it was pure luck, or in this case bad luck. I would have ranked Topps higher. I like that design more and more all the time, for reasons I have not even been able to figure out. The Pinnacle sets are my least favorite of this year, but it may be because most of the examples I have are at least third hand and not in the greatest shape. And since they were so dark, they show every imperfection. None of these sets stand out as memorable. I think Fleer Ultra had the best front design. The best backs probably were Pro Set – I don’t seeing much of these cards back then. I think the set I would want to own would be O-Pee-Chee if I had to pick but it does not have Lindros….. What hurts Upper Deck was the first two years are iconic designs while this one is Meh. That was interesting; I honestly had no idea that ProSet released a set in 92/93. This was a pretty solid year for the looks of hockey cards. I have to say that I do think your #2 and #4 would have been among the bottom 5 for me. I don’t like either at all. You know what they say about opinions, though! Being that this year was the 100th anniversary, wouldn’t it have been 75th anniversary patch? I liked the part about Eric Lindros’s head being placed on a teamates body for the hockey card. I did not know that, as this was the time I started card collecting. I remember as a kid, I couldn’t figure out why he was wearing a white helmet instead of the black one they would have worn on the road. It never occurred to me that they would photoshop it. I remember when the Bowman set came out that year. My thinking was that I would wait it out until the dealers marked down their prices to get rid of their inventory. I had done this with the prior 2 years Bowman sets. As it turned out, this never happened. Either it couldn’t be found or what there was the prices went up instead. I still don’t have the set 25 years later. I thought that the Parkhurst set was very classy looking – both front and back. The colours, the marble effects, the photographs, the write-ups. The reprints were something totally different. I am gradually putting together the Cherry Picks insert set. I started working on it well after I bought the base set. I didn’t realize that the intention was to have another series of the ProSet – interesting fact. Fleer Ultra had a very good first year set. I have never seen the Roenick autographed cards. 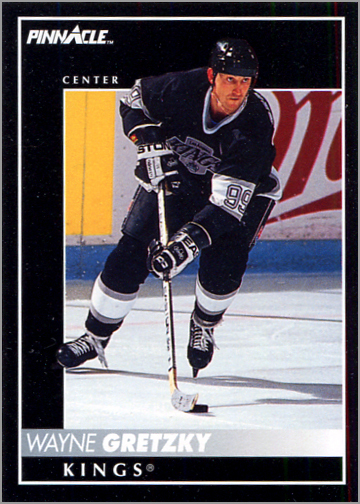 I do remember that the mail in Roenick insert cards were going for a premium for a couple of years compared to the others. Agree about OPC Premier being last in the rankings. Nothing stands out for me on the set compared to the previous efforts and compared to the other sets that year. Hi jeff, welcome to the site, and thanks for sharing. 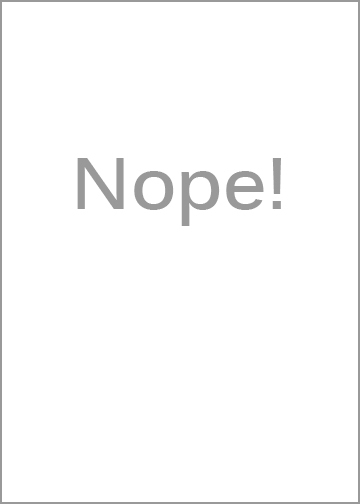 I’m glad you enjoyed the article.